Nitzer Ebb and Die Krupps are confirmed to play a show in Aarhus / Denmark at the Train during their upcoming Join In The Rhythm Of Machines tour. The show will take place on the 25th of April. The next two dates on NEP 2011 tour schedule are confirmed now: Valencia in Spain on May 14th, 2011 and Leiria in Portugal on July 29th, 2011. Further dates will be confirmed soon. The 2 day incident will feature performances and unique collaborations from Mute artists past, present and future alongside DJs, talks, workshops, screenings and installations. A celebration of Mute’s unique and influential work as a label and publisher, the occasion will see all of the Roundhouse’s public spaces open together for the first time. 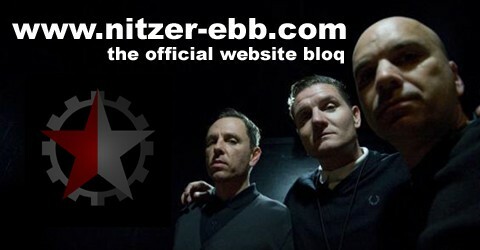 Under the slogan Join In The Rhythm Of Machines Nitzer Ebb und Die Krupps will be touring in europe for nine exclusive shows. Besides an EP, which is being recorded at the moment and, which will only be available at the shows, you can expect more surprises on the night of the event. If you don’t want to miss this chance to catch the EBM heroes together, don’t wait to long to purchase your tickets. NEP are confirmed to play the Electron Festival in Geneva on the 21st of April 2011! The Phoenix Show on Februar 12th, 2011 will be the 100th concert since the Industrial Complex Tour Launch at the Elektrowerkz in London in 2009 (including the opening slots for Depeche Mode).